Now let’s talk about socks. Generally, there are two categories of socks; the ones that make a great hike bad or those that do their job and you don’t notice them. But what if there was a third category? 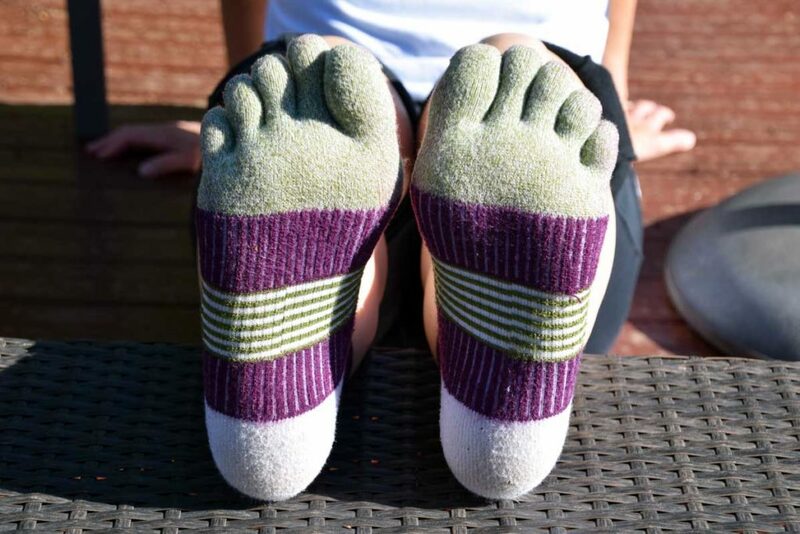 What if your socks really helped your feet to feel great? Well that’s why I wear Injinji toesocks …. when hiking, when jogging and whenever I can. It has taken me a long time to find the right socks. For some peculiar reason, as soon as I put my feet into socks, my toes scrunch together like magnets! So, anything that encourages my toes to spread out, the better. I must admit that these socks do take me back to the rainbow hand knitted toe socks from the 70’s but Injini’s are much more evolved than that! 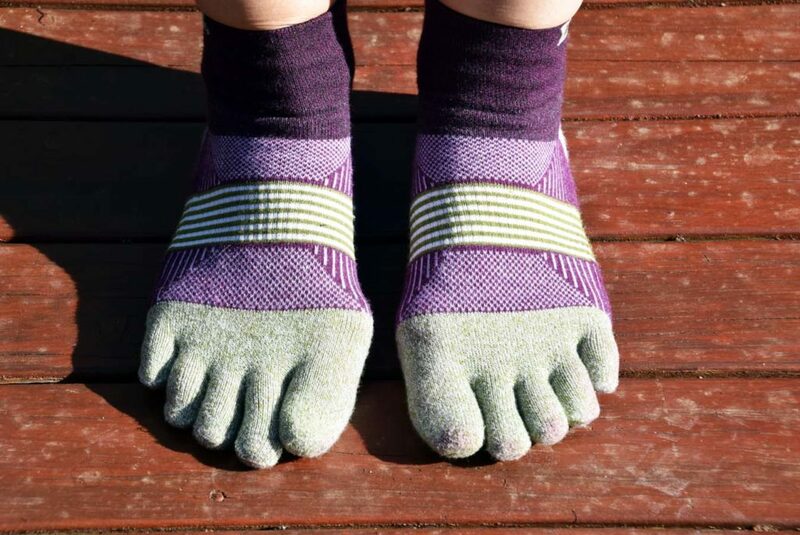 Injinji has a range of toesocks for walking, running and trail hiking for both men and women. 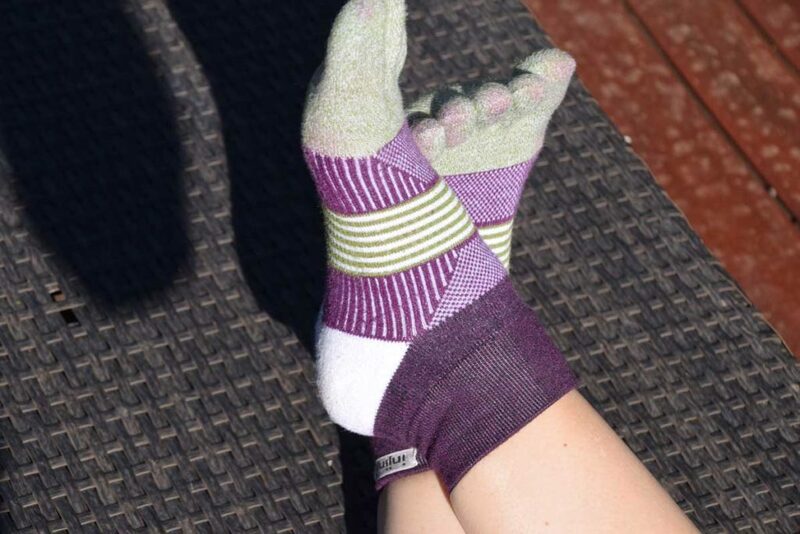 The Injinji Trail 2.0 Women’s Mid Weight Mini Crew Toesocks are designed for women’s feet and provide the toe spread that ensures you use your whole foot while hiking. There is plenty of cushioning in the right places and the CoolMax fabric wicks away moisture. I am prone to getting blisters and since wearing Injinji toesocks for hiking (I have been wearing them for a many years for running), I rarely get blisters when hiking and never around my toes. The Mini Crew height rests above my ankle which is just the right height for my Altra Lone Peak 3.0 Neoshell Women’s hiking shoes. The cuffs are quite thick so the socks stay in place and won’t get ‘eaten’ by your shoes! These socks come in two sizes XS/S and M/L – I wear the M/L given I am a US 9 or 9.5. However, if your foot is much bigger you might be stretching the sizing a little. One negative is the heel colour of the Mulberry version – its white! The part of your socks that get the dirtiest is white – makes no sense to me. They do wash up well but not back to the pristine white heels I started with. Heel colour aside, the Injinji Trail 2.0 Women’s Mid Weight Mini Crew Toesocks are a great choice and I never hike without them! Please note that our affiliations do not influence, in any way, the independence of our gear reviews. If we don’t like something, you will hear it from us!